Three beach huts the size of garden sheds have gone on sale with a guide price totalling nearly £300,000. The "glorified sheds" with no toilet facilities but stunning views are up for sale for £80,000 each plus VAT. The huts, on Mudeford Sandbank, Dorset, have no running water or electricity, but boast views of the Isle of Wight. The buyers will also have to pay £1,784 a year to the council for the sand plot and the privilege of sleeping in the huts nine months out of the year. The huts are only accessible by a ferry or boat from Mudeford Quay or on foot or by a small land train from Hengistbury Head. Fiona Forsyth, assistant manager at estate agents Richard Godsell, said: "It's a fantastic location and a hell of a lot cheaper than any other potential second property. "I know it's only a glorified shed but it's a fantastic location." 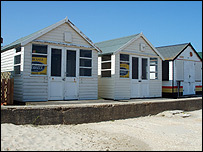 Last year, the most expensive hut to date on the stretch of beach, where there are 354 huts, sold for £165,000.